Waterfalls in New Zealand come in all shapes and sizes, catering to whatever fitness level and adventure you are planning; rain or shine – wet or dry. And the Bay of Islands and surrounding Northland has a truly stunning array of options. There are the thundering, powerful types that command attention with their sheer volume and size. Then there are the graceful ones that relax you with a sheer trickle, where you can jump on in and frolic in a catchment directly underneath. Some are situated on a delightfully flat, well-maintained walkway grandma will appreciate, and others that are located across jaw-dropping terrain fit for Frodo and Samwise Gamgee. So even though TLC told you not to, you really should go chasing them (ahem, sorry, we had to – come on!). 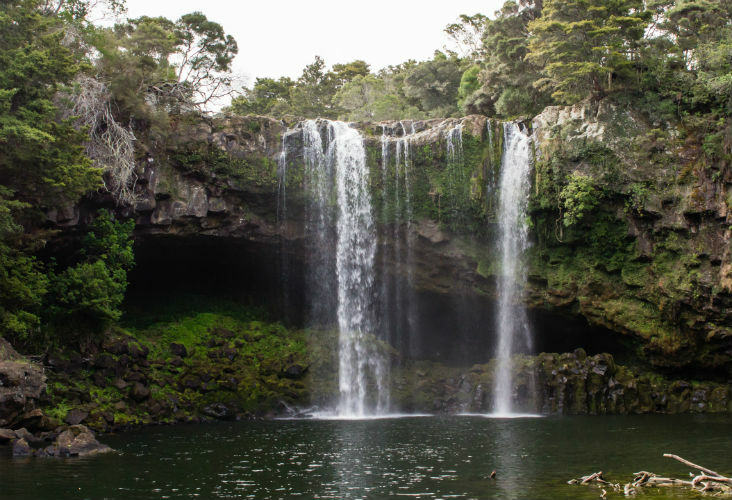 Read our guide to the best of the Bay of Islands waterfalls here. 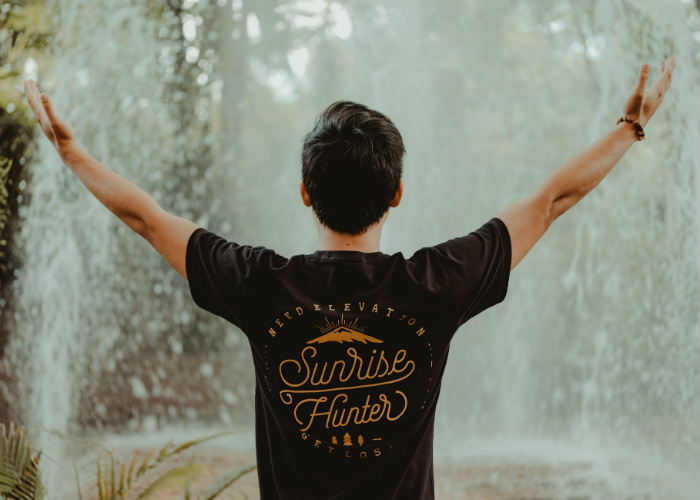 Much like climbing up a rocky traverse to the peak, or watching a beach in a storm, you can’t ignore the commanding presence of nature when you’re in front of a waterfall, especially when it puts on a loud, forceful display with a deluge of clear water. Plus, water can be quite simply, relaxing. It’s why we build waterfalls in our gardens. And the reason your beautician plays music with audio of water flowing while you have a facial (which I’d suggest you book after your forest walk! Read our recent blog on wellbeing & ‘pampering’ in the Bay). Whenever I’m up in the Bay, or Northland for that matter, my family and I like to include a hike or walk in our schedule. It’s a great place to take time out and kid myself that I’m keeping fit. And the children LOVE a waterfall as a reward for their walking efforts. 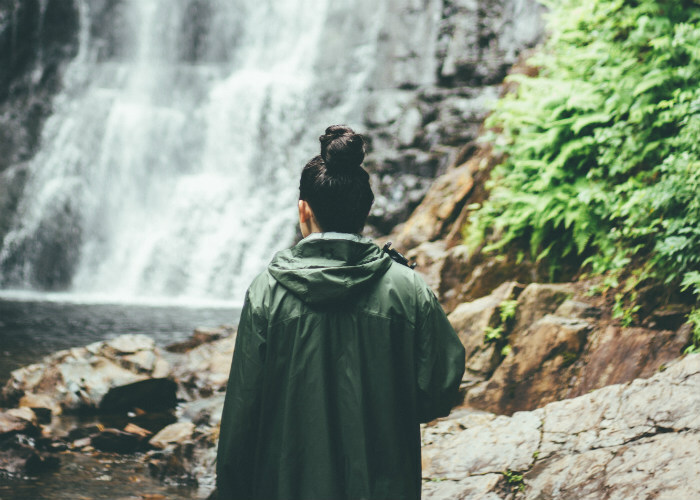 In fact, a waterfall hunt is a particularly great option if it’s raining. Photographing them is enhanced when under clouds, and rain, of course, gives more life to a waterfall. So regardless of the state of the weather, it’s nice to still make the most of your time. Another bonus is that they’re all free to visit! You won’t find any ‘entry fees’ or gift shops near a waterfall around here. Paihia is a base for many travelers – so let’s start with options nearby. This spectacular 27-metre waterfall is utterly breathtaking. With easy access for all fitness levels (and wheelchair access), Rainbow Falls is a must-see in the Bay. Navigate to Waipapa Rd (follow signs to ‘Rainbow Falls’) and follow it for the next 1.1km, then turn left into Rainbow Falls Rd, and you’ll reach a car park. If you are reasonably fit, consider the Kerikeri River Track to visit historic Stone Store and Wharepoke Falls (also listed here). Find out more about what to do in Kerikeri. 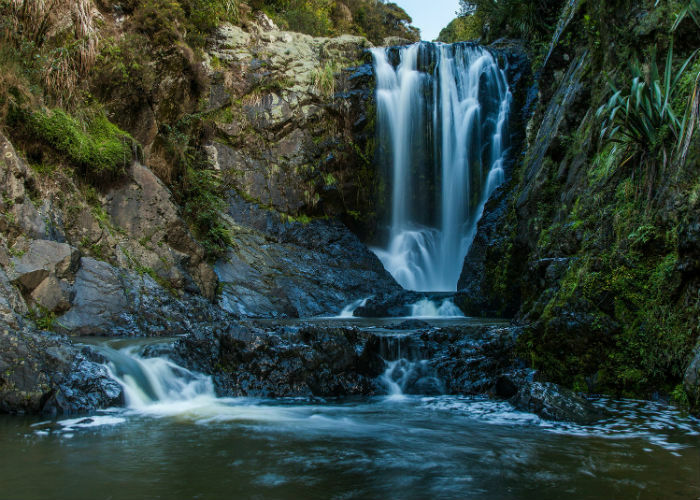 Haruru Falls refers to both the breathtaking waterfall, and a small, historic settlement nearby, about three kms inland from Paihia. Haruru means “big noise”, and the waterfalls in a rare horseshoe shape, so it’s well worth a drive or walk. 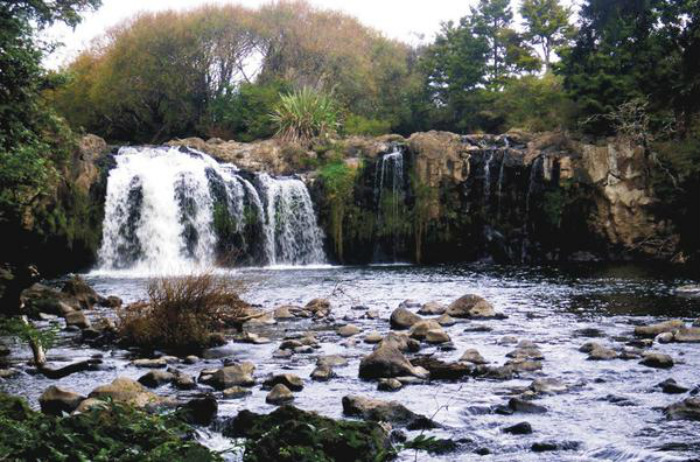 Maori legend says that a taniwha (water monster) lives in the lagoon below the spectacular falls. Let us know if you spot him! You can drive and park there (falls only 2 mins from car park), but we’d recommend taking the walking track between the Falls and the Waitangi Treaty Grounds, part of it a raised boardwalk over tranquil mangroves. It is around 6kms one way, which is around 2.5 hours so you’ll need a coat and decent shoes. 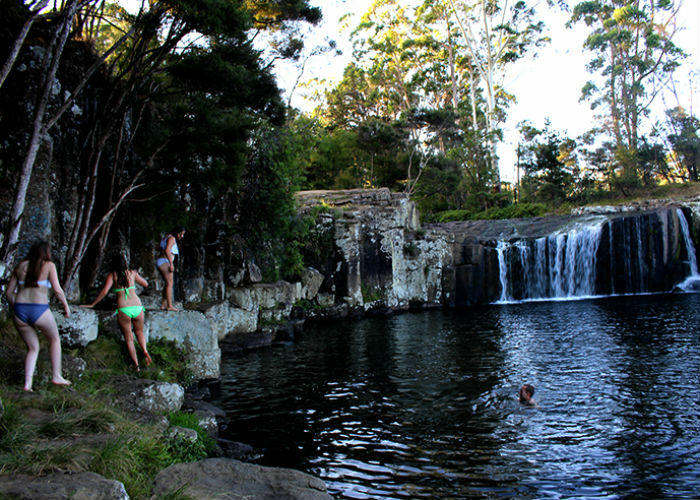 Charlie’s Rock Waterfall is 30-minutes from Paihia, over sealed road. It’s popular among the locals as a sweet swimming spot. In Kerikeri, navigate to Landing Rd until you reach a bridge over the Waipapa Stream. You’ll spot a good-size car park with a sign, ‘Waipapa Landing’. There are toilets and picnic tables available here. From the car park, cross the road and walk along Landing Rd (direction: towards Kerikeri Centre) for the next 100m until you see a sign ‘Welcome to Charlie’s Rock Walkway’. From here it’s only 10-15 minutes walk, but can be slippery, steep and stoney in places. Note: Not to be confused with ‘Wairua Falls’ on the Wairua River (see waterfalls near Whangarei below). Access here was actually lost for more than 60 years and the track was re-opened in 2017. So, for this reason, it’s quite special to be able to see this waterfall. To get here, make your way to Kerikeri. Find Cobham Rd and follow it for the next 800m until you reach a bridge over the Wairoa Stream. Spot the car park near the bridge (no facilities) – across the road is your starting point. From here walk across the Wairoa Stream via the vehicle bridge, turn left and follow the path. After a short walk you’ll see the beginning of the track (a gravel path). The falls are about 5 minutes from here. If you want to do the round trip just walk the path descending to the falls’ base. This part of the track is quite steep and sometimes muddy, so take care. 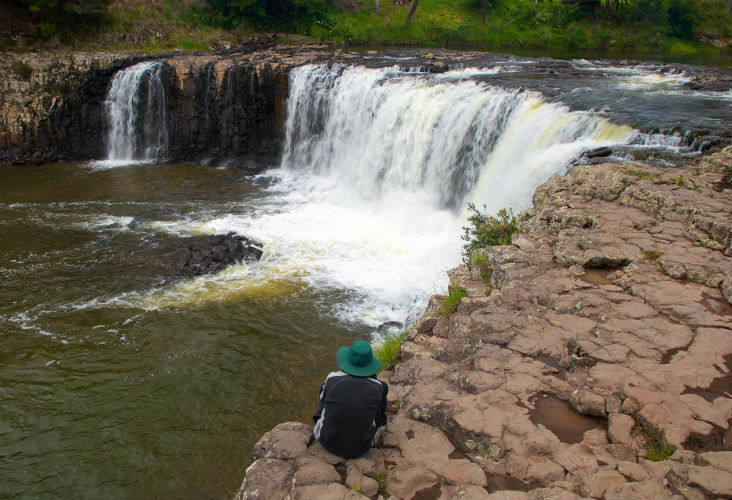 There are plenty of waterfalls you could visit as day trips further afield, if you have a motor vehicle and some time up your sleeve. Here are few that are not far from The Bay of Islands region. 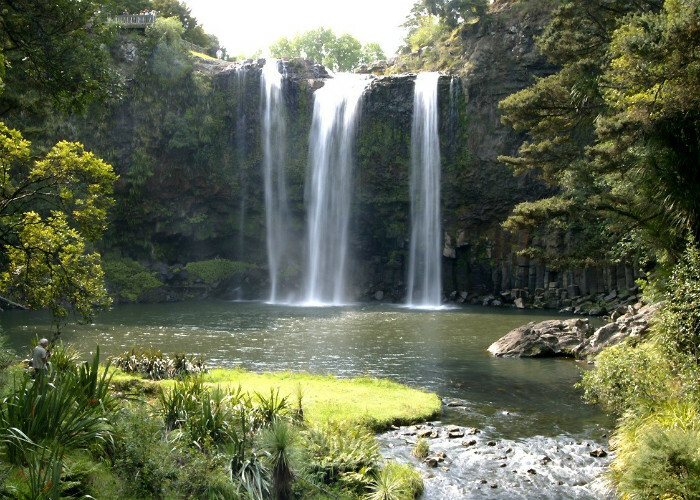 Just on the edge of Whangarei is this sizeable waterfall, 26m (85′) high. The classic curtain waterfall is part of the Hatea River and a popular swimming spot. 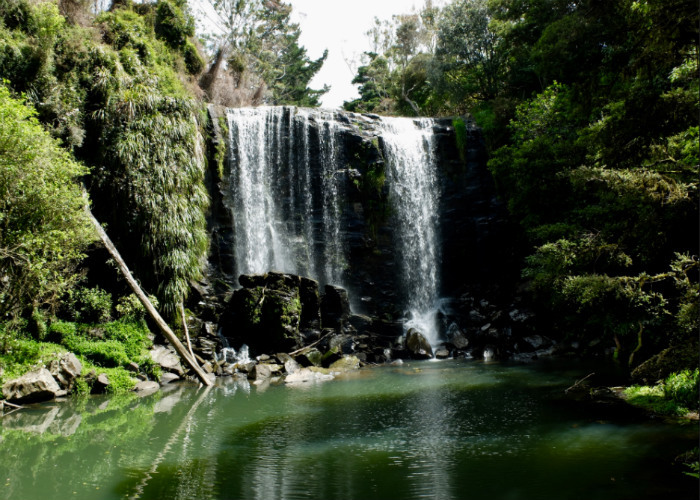 Easy access and a well-maintained scenic reserve make this waterfall a hot spot with tourists and locals alike. The water is dependant on rainfall (yes, like all waterfalls – just don’t come expecting huge torrents in a dry summer). Simply find the car park off Boundary Rd. There are toilets as well as a quaint picnic area. An easy walking path leads to the upper waterfall’s lookout, suitable for all abilities. If you want to head to the waterfall’s base, cross the river via a bridge and follow the track. Around a minute after crossing the river you’ll see one more upper lookout, and from here it’s only 5 mins down to the base. Come up the same way or continue doing a loop track (30 mins) which is a lovely bush walk. Paranui Falls is roughly a 10-minutes’ drive from central Whangarei, and the road surface is sealed. It’s easily accessible in a woodland park, and one of it’s biggest drawcards is the walk through the kauri tress which are a magnificent sight in their own right. Although the map says ‘Paranui’ and it is on the Paranui Stream, the signs all say ‘Pukenui’. There’s a car park at Clapham Rd (with no facilities) and a track starts from there, descending to the waterfall’s base. It takes around 10 minutes to reach the falls themselves. Be careful – the stones can get slippery. Return via the same track. 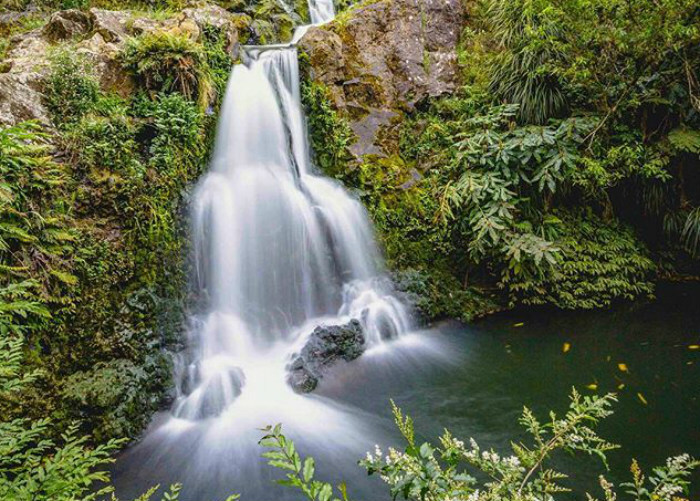 Raumanga Waterfall is located in the Raumanga Valley Reserve, which is nicely situated within Whangarei itself, so you can explore the city after. Total walking time (one-way) is about 30 minutes. The walk to the falls starts from Tarewa Park off Raumanga Valley Rd, where you can leave your car on the side of the road. There are no facilities here but toilets can be found near the Information Centre (Tarewa Park), along with lots of picnic tables in the Raumanga Valley Reserve. From the park entrance follow the walking path for 2-5 minutes and you’ll reach the top of the waterfall, where you’ll need to pull out the camera. Then just follow the official path downstream until you find the waterfall. Return via the same track. 10km east of Whangarei Falls at Whareora, is the Taheke Falls. 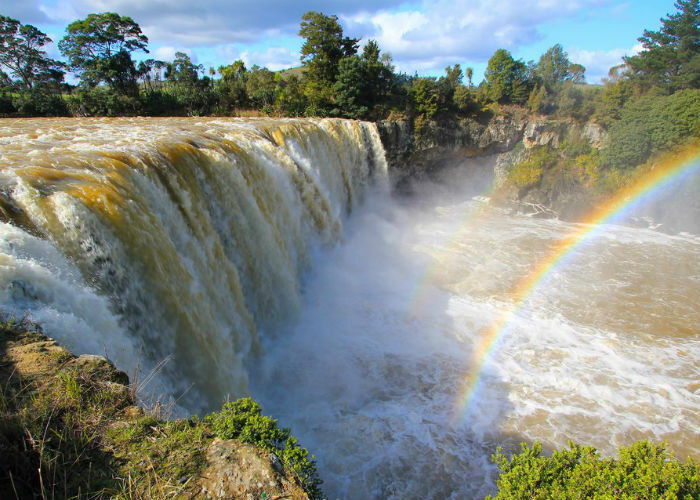 It’s a stunning 46m high – the highest waterfall in Northland. It’s just 20 minutes’ drive from Whangarei. The track is on Hoban Rd. From the car park there follow signposted ‘Taheke Waterfall Track’ which is a loop of around 3km. The waterfall can only be viewed from a wooden platform, looking down. Unfortunately, a track to the lower viewing deck has been closed permanently due to Kauri dieback disease (see more on this below). You can just go to the viewing platform and return which is an easy distance from the car park. Around 20km west of Whangarei (30 minutes’ drive) on the Wairua River, which drains a large area of swamp, is Wairua Falls. The road surface is sealed, apart from the last 2 km which is a gravel road. In Mangautapere, find Mangakahia Rd and you’ll see a well-signposted ‘Wairua Falls Road’ (gravel). Follow it for the next 2 km until you reach the car park. There are no toilet facilities here. The waterfall is seen from the carpark. There is no official track down to the base, so just stand and take in the views and sounds! 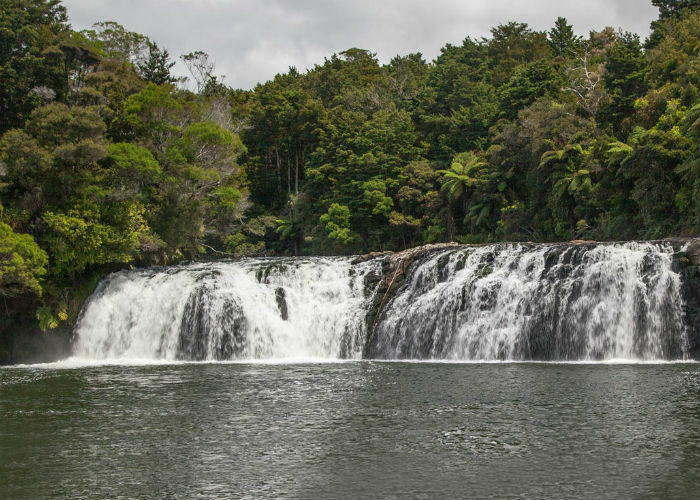 These falls are 45 mins drive south of Whangarei – so this one is a bit of a mission from Paihia (but it’s worth considering if you’re on your way up north to the Bay from Auckland). This is slightly tricky to navigate but don’t let that put you off this hidden gem. If heading north from Auckland, just past the ‘Waipu straight’ (Waipu is a good beach stop off BTW!) the road starts to climb up the narrow Brynderwyn Hills. Turn left into a gravel Waipu Gorge Rd and follow it for the next 7 km. A carpark is on your right and has a sign (there are no facilities). The gravel road is windy, but don’t fear, there’s a nice easy track (20 mins) once out of the car via a picturesque gorge to reach the falls. 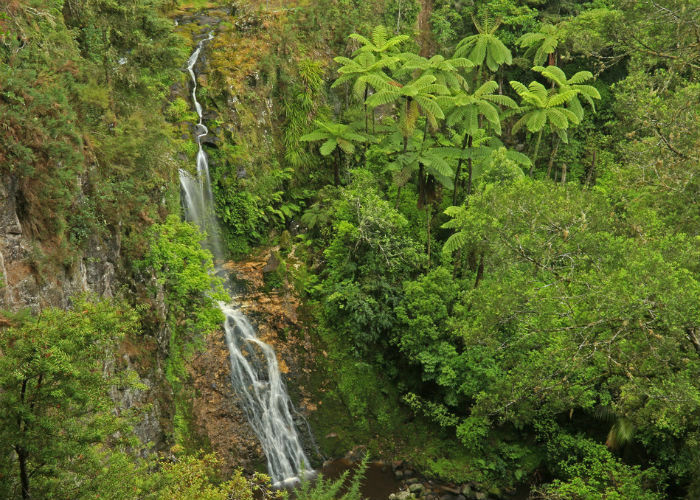 Most of the waterfalls covered in this post are a short or long walk through native bush. When doing a bush walk in NZ, it’s really important you’re well prepared in case of changes in the weather, or the unlikely event that you get lost. Wear comfortable walking/hiking shoes. If you haven’t worn them in, take plasters just in case! There’s nothing worse than a blister and a long walk home. Always supervise children, especially near water. Most importantly – take a deep breath in as you walk, and enjoy the sweet scent of nature! 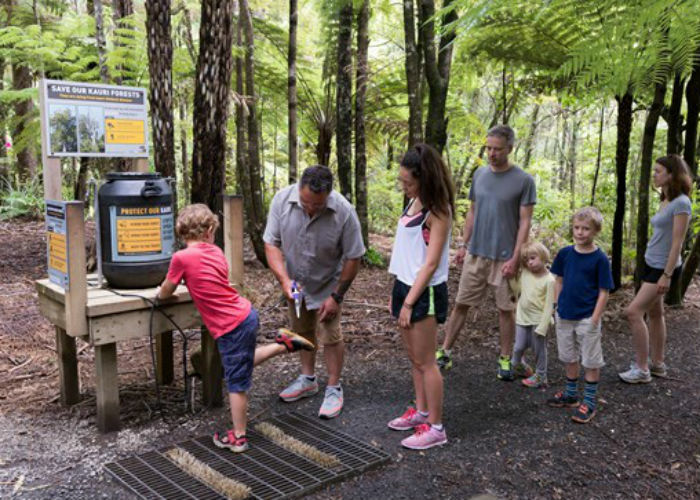 If you’re walking through native bush in Northland or the Bay of Islands to get to a waterfall listed above, chances are you will be near a Kauri tree – or perhaps even a huge Kauri forest. Kauri are considered ‘taonga’ in Maori, which means they are a sacred treasure. The native tree has deep spiritual significance as well. When you stand before these huge ancient trees (the largest trees in NZ) you are in the presence of living entities that were mature trees before any human came to the shores of Aotearoa. We think it’s essential to know about Kauri Dieback Disease – and what you must do to help stop the spread. Kauri dieback is a disease that’s threatening kauri with extinction. Phytophthora agathidicida is the pathogen that is causing kauri dieback, and was only discovered in 2009, and formally named in 2015. The pathogen can sense a kauri tree’s roots, and swim towards them using a tail-like flagella – which is rather crazy to imagine! The disease can kill kauri of all sizes and of any age – from seedlings to giants that pre-date human settlement. There is no cure for it as yet, and the disease kills most if not all the kauri it infects. Incredibly it can spread by just a pinhead of soil on a shoe, and you can’t always tell by looking whether a tree is infected or not at first. 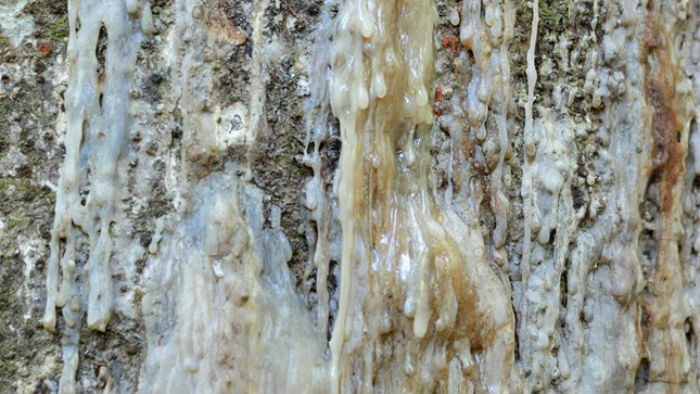 Kauri can be saved if walkers, hunters, horse-riders and mountain bikers clean footwear and other gear before heading off on a hike and going near kauri; even if the gear has been in storage (the pathogen can hang around dormant in a cupboard – scary stuff!). In fact, “cleaned” is too soft a term – experts say “disinfect”. You should clean shoes again before leaving an area with kauri. On many forest trails there are cleaning areas provided, and signage about the disease. We take our own disinfectant wipes to clean shoes and put them straight into a bag – and wash gear again when we get home. It’s not a huge effort considering the damage the disease does. Please spread the word about this to fellow visitors in the area. ‘The fight to save kauri from kauri dieback involves everyone – government, tangata whenua (people of the land), regional communities, sporting groups, recreational groups, business and individuals – all working together. You can call the Kauri Dieback Programme hotline on 0800 NZ KAURI (69 52874) or email kauridieback@mpi.govt.nz for more information or report a tree that looks unhealthy’.